NOAKHALI, Bangladesh, Nov 10 2011 (IPS) - Char Nongolia village is a basket case when it comes to climate change impacts such as increasing salinity, frequent cyclones, tidal surges, erratic rainfall and extended droughts. Yet, the 40,000 people of this village, sitting on a delta that drains the sub-continent’s major river systems, have endured the creeping devastation of their homeland in southeastern Bangaldesh with no help from anywhere. There is no drinking water supply, no land to grow food crops on, no healthcare facility, no roads, no jobs and absolutely no sign of any security or authority. Any natural protection afforded by forests has long ago been stripped away. “Today we have nothing left. Even the last piece of land we had was lost to river erosion,” said Salma Khatun, 72, narrating at a climate hearing for women in this village, late October, how her family steadily lost its farming lands to erosion. “We moved to this place from nearby Hatiya island about nine years ago after we lost our ancestral home to river erosion. After settling here the same disaster hit us five more times,” said Arzu Begum, 35. Arzu and her husband Anwar Hossain and their extended family of ten lost all their belongings to river erosion and floods and now live in a flimsy bamboo hut perched on the river bank. Khadiza Akhtar, 24, moved with her husband to Char Nongolia five years ago, hoping to build their lives here. But, last year’s flood and the incessant river erosion washed away all her dreams. 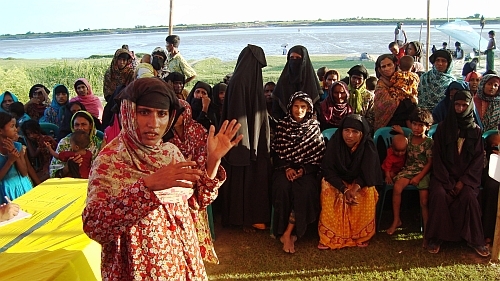 Several other women, victims of climate change, told stories of lost livelihoods to a mock jury at Char Nongolia organised by a local non-government organisation, Noakhali Rural Development Society and the People’s Forum on the Millennium Development Goals with support from the Global Call for Action Against Poverty. Lawyers from Noakhali town patiently heard the women’s stories of sufferings amid a crowded audience at a site where many victims had lost their homes. The women hope that their voices will reach the United Nations climate conference starting in Durban on Nov. 28. “How many more times do we have to suffer? We have lost all our belongings eight times in the past three years. I cannot take it any more, God help us,” cried out Jannatul Ferdous. Ferdous, 26, lives on a piece of land not far from the river bank with her husband and two young daughters. Once a successful fisherman, Ferdous’s husband has been reduced to penury. Once known for its rich forests, Char Nongolia is now barren and surrounded by similar islands of accumulated silt. Farming is now rare, although riverbeds and embankments are known to be naturally fertile. For centuries, the people in this area coped with cyclones, floods and droughts but the adaptation to increase in frequency and intensity of adverse climatic events has reached the limit. “We never had extreme cold or high temperatures. In fact, we never experienced drought and fog during our childhood,” said Nurul Islam, a 74-year-old shopkeeper. Char Nongolia and the surrounding dried-up riverbeds (locally called char), were once famous for an abundance of freshwater fish. People would sail in from all over the country during the peak season to buy up the fish. “We used to sell several tons of fish every season and the cash would flow in. But now the catch has reduced drastically,” said Syed Abdullah, 68, who now puts out to sea to continue with his profession. “During those days people in Char Nongolia were relatively well-off. But look at what nature has done to us. Today we have no work,” Abdullah said. Most of the able-bodied men have migrated to the port city of Chittagong to find jobs, leaving the women to fend for themselves. Even the microfinance institutions that have helped women across Bangladesh is missing from these parts. The district commissioner, Sirajul Islam, told IPS that he would soon launch ‘vulnerable group feeding’ entitlement cards for the poor in Char Nongolia to enable them to survive. A reforestation campaign to protect the survivors from cyclones and river erosion is also on the cards. “I have already requested the concerned officials to release the funds,” said Islam. But past promises on reforestation and the construction of embankments, to mitigate natural disasters and the effects of climate change events remained unfulfilled. Such is the air of helplessness in the coastal regions that Bangladesh’s junior minister for environment, Hasan Mahmud, admitted at a recent public meeting that close to 30 million people are likely to be displaced soon by the relentless loss of land. According to the United Nations Inter-governmental Panel on Climate Change, given a business as usual scenario, 17 percent of Bangladesh would be submerged uder seawater by 2050 with several hundred million people forced to migrate from the coastal zone.